So, if you're at the right place at the right time with the right gear, your fish of a lifetime may be passing by right now! Sockeye catches are slowing down. Catches are still reported, but not the easy limits of 2 weeks ago. You have to travel around to find a school and work hard to stick with them now. Successful anglers are reporting cruising around at half plane with no gear in the water until they see fish on the surface or on the sounder, then fishing them hard once found. Coho are starting arrive in local waters, with reported catches into the teens of the scrappy silver salmon. Let's hope for a productive late season, as that's about as fun as salmon fishing gets. 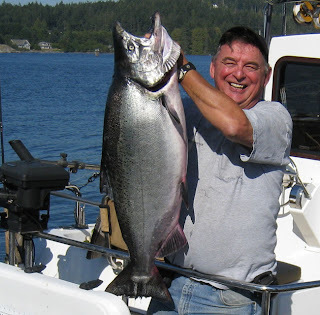 The Sooke Salmon Classic Derby was held this weekend, with Des Hatcher (Vicious Fishing Charters, FishingSooke.ca member) taking the top prize with a 33 pounder. It was Des' 40th birthday yesterday, and the $100,000 top prize is about a pretty good way to celebrate it. Congrats Des!